On Episode 210 of the Mama Bear Dares Podcast, Tesi and Leslie take a break from politics and gnashing of teeth to reflect, recharge, and “get their house in order” so that they can be more effective in the passionate march toward more love and more justice. The women talk about the beauty of simplicity and the challenge of finding peace and balance as a modern-day American woman. They focus on money, media, parenting, and relationships and within each category discuss ways to simplify life in order to live with clearer intentions and meaning. The Mama Bear road to revolution is always complex and today it points inward. end some love to the mama bears with a review on itunes! Your attention helps grow this community! 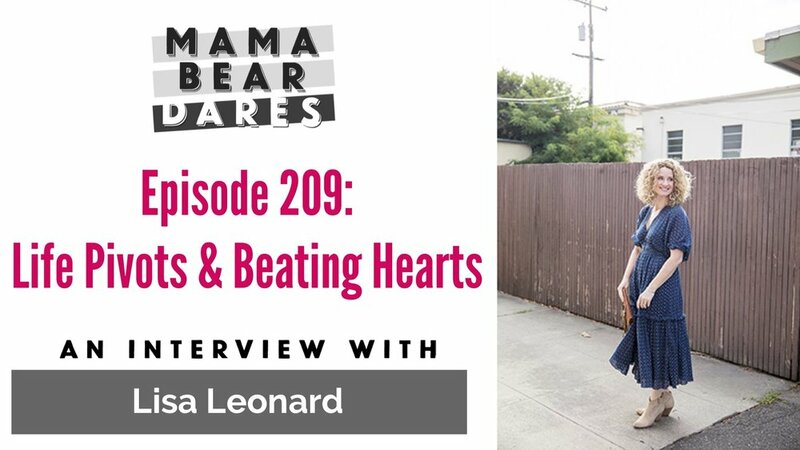 On Episode 209 of the Mama Bear Dares Podcast, Tesi and Leslie sit down with Lisa Leonard, the woman behind the much-celebrated international company Lisa Leonard Designs. During this conversation, Lisa pulls back the curtain on her success and reveals that for most of her life, she struggled with perfection and self-worth … trying to be the perfect mom and the perfect wife, all while running a thriving business. Lisa shares the story of how her world crashed down around her and how through reflection, therapy, a supportive community, faith, and hard work, she is now living a life of more balance, more honesty, and more joy. These three women bring it ALL to the table and their conversation is authentic, relatable, and completely inspiring! We love Grove.co are excited to offer you major savings with your special mama bear code! Like what you hear? Help us grow this community of Mama Bears with a review on itunes! On Episode 206 of the Mama Bear Dares Podcast, Tesi and Leslie sit down with Leslie’s personal Patron Saint of Time Management, Laura Vanderkam. A hugely successful author and expert, Laura offers listeners researched and thoughtful advice on managing the precious resource of time, setting priorities, and structuring a day, week, month, or year to experience the most love, peace, joy, and productivity possible. In a light-hearted and information-rich conversation, the women also dive into balance, women in the workplace, and parenting schedule-savy kids. Get Free At-Home Try on with Warby Parker and the Mama Bears! Help us build this community by leaving some love for the Mama Bears with a review on itunes! On Episode 205 of the Mama Bear Dares Podcast, Tesi and Leslie sit down for a fascinating conversation with Grace Estripeaut, a mental detox expert and all-around fascinating woman. The three jump right in to discuss Grace’s story and life’s work. Grace helps listeners with stories and practical steps to guide them to a calmer life with more clarity. Grace shares tips on how to switch off your busy mind and decompress so you can actually sleep and start the next day refreshed, how to boost your energy and improve your mood, how to find SPACE in your life, and ways to fuel your tank, encourage your vision, and stay focused on what matters most -- regardless of what’s happening around you! Listeners will be blown away by this conversation! Click here and Use your Mama Bear Code for great savings at care/of! Need a new Website? Save money on a great site at Wix by clicking here! Leave some love for the mama Bears by clicking here! On Episode 204 of the Mama Bear Dares Podcast, Tesi and Leslie go back to school to learn more about INTERSECTIONALITY. The co-hosts are earnest in their discussion and do their best to define the term, learn its history, and drive home the importance of considering interectionality in our feminism, advocacy, and march toward justice. Listen to Kimberle Crenshaw’s podcast, Intersectionality Matters. Find it HERE. Listen to Episode 163: Let's Do Better By Black Mothers & Babies: A Look at Racism in the American Healthcare System. Get FREE Mrs. Meyers with your mama bear code at Grove.Co! Leave some love for the mama Bears with a review on itunes! 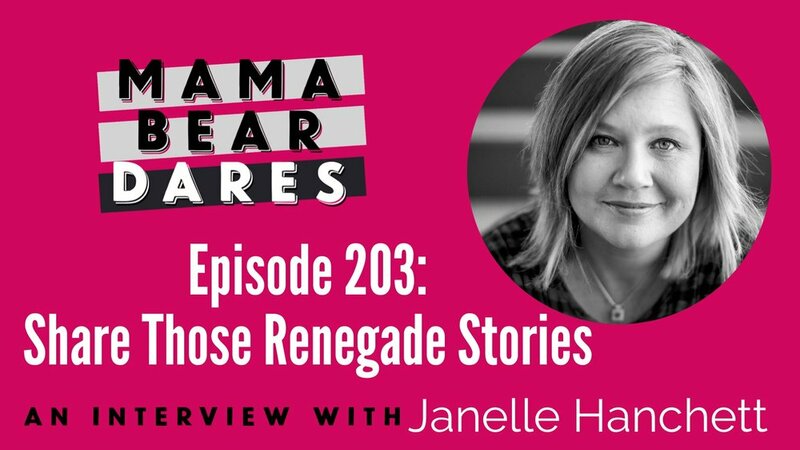 On Episode 203 of the Mama Bear Dares Podcast, Tesi and Leslie get really real, really fast with Janelle Hanchett, founder of Renegade Mothering and author of I’m Just Happy to Be Here. The three take on the illusion of perfection, the freedom of truth, the power of sharing your story, and the hope in everyday miracles…even after trauma. The conversation is intimate, passionate, and a must-listen for anyone who needs a dose of compassion and a wallop of courage. Your gonna want to try Native! Click here and use your Mama Bear promo code for 20% savings! Click here for 10% off your entire website at Wix! Like what you hear? Leave some love for the mama bears! 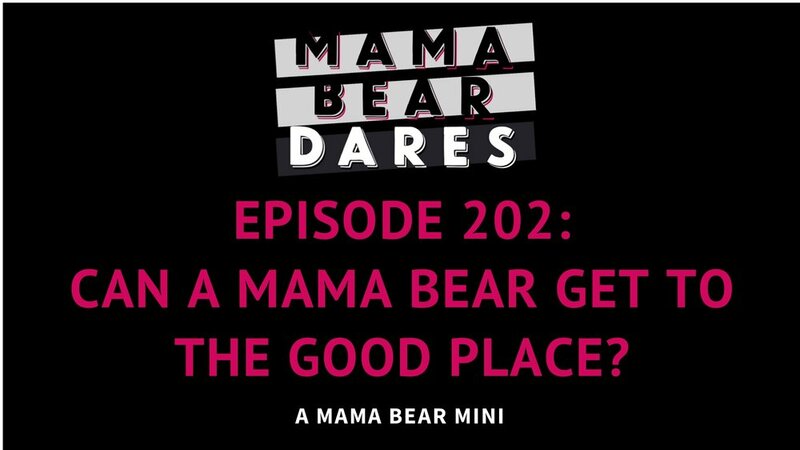 On Episode 202 of the Mama Bear Dares Podcast, co-hosts Leslie and Tesi talk about their love of Kristen Bell, Maya Rudolph, and The Good Place. Without any spoilers, the two women discuss a quandary presented in Season 3. Can any of us really get to the good place? Are the systems in place keeping us from eternal peace? Is it even possible for a modern-day Mama Bear to be a truly “good” person whose actions reflect her heart? The two women have so many questions and they explore this idea with candor and curiosity. For good measure, the sister-co-hosts end the show with a few segments that listeners are sure to relate to. For a great deal on an amazing new online retailer, Grove Collaborative, click here! For a Mama Bear discount on a WIX website, click here! Want to give some love to the Mama Bears? Find them on itunes and leave a review! On Episode 197 of the Mama Bear Dares Podcast, Tesi and Leslie sit down to rehash highlights from 2018, discuss the things they were thankful to live through, cast a personal and podcast vision for the New Year, and celebrate the dawn of a fresh page of the calendar. They discuss their favorite books and pop culture moments, laugh a lot, shake their fists a few times, and admit some hard truths. Ultimately, anyone listening will feel encouraged to live intentionally and be reminded that they can do the hardest things. Find the podcast episode (Do No Harm) referenced in this episode here. 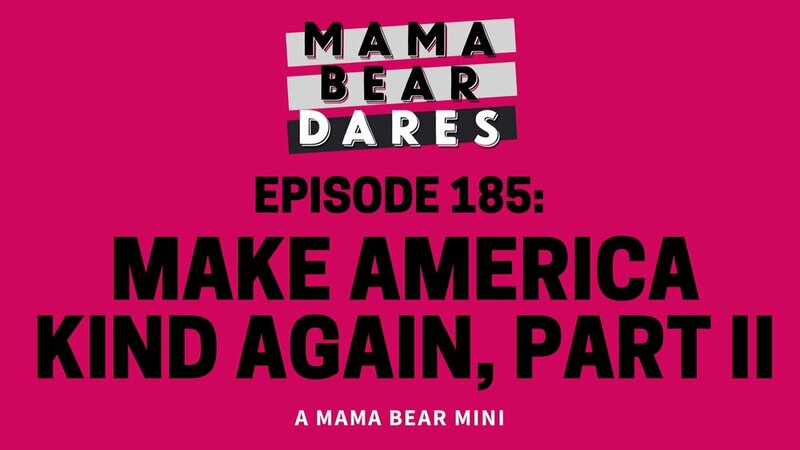 On Episode 185 of the Mama Bear Dares Podcast, Tesi and Leslie re-visit the topic of kindness in America in 2018. Not only do they reiterate the importance of modeling kindness and teaching kindness to the next generation, but they also discuss how to live a healthy life of kindness. Thanks to a listener suggestion, they take a look at Brene Brown’s theory that the most compassionate people are the most boundaried and they discuss how to incorporate healthy boundaries in the Mama Bear life. Also discussed is the very real and very sobering fact that America has historically not ever been kind to certain groups of people. They acknolwedge this blindspot and vow to work even harder to steer the ship away from an undeniably sullied past and toward a kinder, gentler future for ALL people. Go back and listen to MBD Podcast Episode 181: Make American Kind Again, Part I. Make a mama bear's day and leave a review for the pod on itunes! On Episode 179 of the Mama Bear Dares Podcast, Tesi and Leslie celebrate big birthdays and back to school! This Labor Day Mama Bear Mini is devoted to milestones, lessons learned, and the beauty of taking the time to check in on your own life through a little time and reflection. Tesi and Leslie both share some of the pivotal lessons they've learned over the last decade, enjoy a few laughs, and encourage their listeners to mark moments, check in with friends, and love the life they've been given. Th episode is filled with sisterly advice as the women practice the reflection that they preach. Use your exclusive Mama Bear Code at True Botanicals! Leave the Mama Bears some Love with a review on itunes! On Episode 178 of the Mama Bear Dares Podcast, Leslie and Tesi sit down with the dynamic and inspiring Autumn Miles. Autumn is a speaker, radio host, author, advocate, and survivor of marital physical abuse. The women talk about the #MeToo movement, the role of community (and church) in unhealthy relationships and divorce, and how the world can step up in supporting women in the midst of abuse. Autumn courageously shares her personal story and hard-won wisdom, and gives listeners important information on how to spot domestic violence occurring in the lives of loved ones and how to get help if it's happening to you. Furthermore, the conversation covers the broader theme of recognizing your own belovedness ... something that belongs to each of us and is up to us to claim. Click here to find out more about Autumn! Use your code for a free pillow with a Purple Mattress purchase! Use your exclusive mama bear promo code at True Botanicals! Leave some love for the mama bears by rating and reviewing the podcast on itunes. On Episode 177 of the Mama Bear Dares Podcast, co-hosts Tesi and Leslie discuss privilege, racism, and 10 ways they believe white moms can use their privilege to fight racism and spread love. They trust that the podcast community is a safe place to express their observations, experiences, and beliefs about this topic and humbly ask readers to consider their perspective, poke holes in their theories, and promise to journey together to make a better tomorrow. Lovers of actionable steps and lists, Leslie and Tesi come up with 10 tangible ways to engage their Mama Bear in this fight. The 10 steps are listed below. For complete details and explanation, listen in! Leave some love for the Mama Bears by rating them on itunes! On Episode 176 of the Mama Bear Dares Podcast, Leslie and Tesi sit down with the dynamic, wise, and absolutely delightful Dr. Zoe Shaw. Dr. Shaw is a mom to five, a psychotherapist, an author, and a radio host who is full of inspiration, energy, and fantastic advice. The sisters relish in their conversation about defining our unique super power and channeling it for the good of the world, saying 'no' in order to define priorities, setting boundaries, parenting teens intentionally, and living our best lives. The Mama Bear spirit is alive in this episode! Find Dr. Zoe Shaw and her incredible resources on her website. Leave some love for the mama Bears on itunes! On Episode 175, Tesi and Leslie sit down with Rumaisa Rahman Kahwaja and talk about her life's journey of learning and exploration. Rumaisa constant posture is love and compassion and the sisters love and appreciate the stories she shares about her journey to self acceptance and power. Rumaisa shares how she was mothered by a mother with mental illness, but has used that part of her story to become an phenomenal mother to her own daughter. Rumaisa grew up Muslim in Omaha, Nebraska, and shares how she shared that part of herself while living in New York and working in fashion during 9/11. 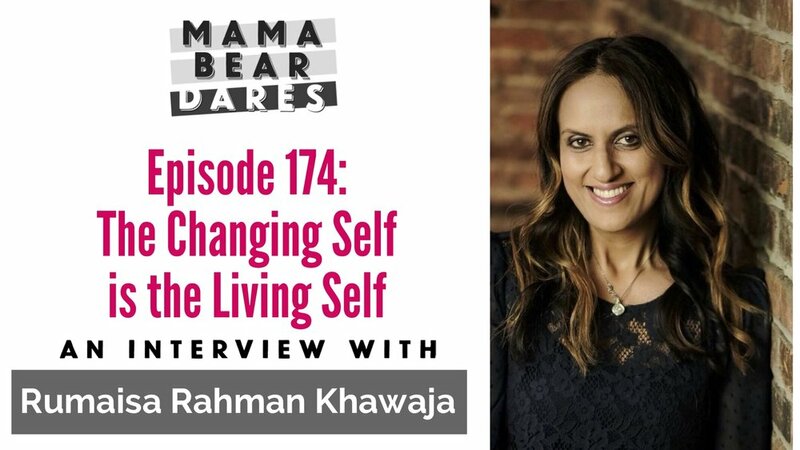 Rumaisa embodies an incredible spirit and she shares her insight and wisdom on the podcast, inspiring listeners to constant growth, acceptance, and re-invention. Virginia Wolf fans will recognize Ru immediately. She's "a self that goes on changing is a self that goes on living." Get a free pillow from purple mattress with your special mama bear code! Leave some love for the mama bear's by leaving a review on itunes! On Episode 168 of the Mama Bear Dares Podcast, Tesi and Leslie are captivated by Sarah Stevens, a wife, mother, entrepreneur, and founder of The Beautifull Project, a truly extraordinary space where ordinary women are encouraged to tell the truth of their bodies, beauty, and belonging. The conversation ranges from shame to hope, from illness to health, and from obsession to freedom, and works to serve as part of a chorus of courage for women who are tired of shrinking and aim to take up space in this world. Whether in the boardroom, in relationships, or in their own unique physical being, women listening will be inspired to accept their body, claim their innate worth, and fearlessly bring their whole selves to an often hurting world. How do we live fully in our bodies? Find Sarah and The Beautifull Project on Facebook, Instagram, and on the website. Links to blogs referenced in the podcast can be found here. On Episode 166 of the Mama Bear Dares podcast, co-hosts Leslie and Tesi sit down with Tatum Drewes to talk about health, healing, and helping. Not only is Tatum an inspiring woman, pioneer, and business owner who believes in helping others live their best, pain-free life, but she's also an expert in CBD oil and the medicinal properties of the hemp plant. Tatum owns Higher Healing and is generous in sharing her passion and knowledge as the hosts learn more about this natural healing phenomenon and how much it can benefit women across a country in the midst of an opioid drug crisis. Find Tatum & Higher Healing online by clicking here. Use your code for great savings and father's day gift giving at Story Worth! You'll love Bioclarity! Use your special Mama Bear savings by clicking here. Leave some love for the Mama Bears by rating and reviewing us on itunes! 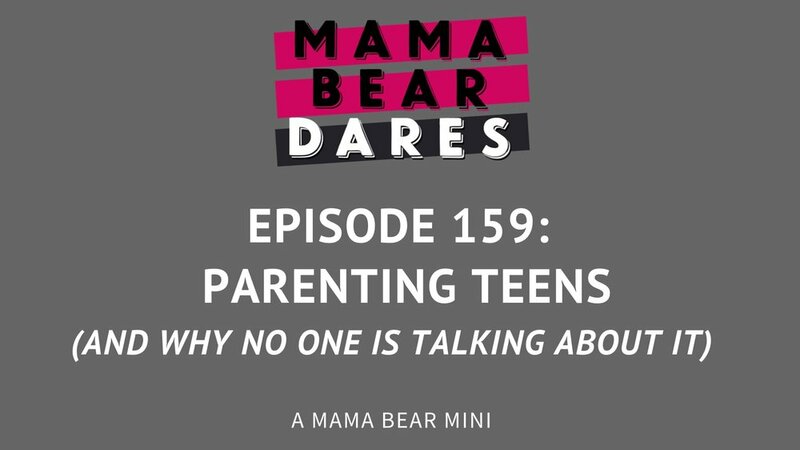 On Episode 159 of the Mama Bear Dares Podcast, Leslie and Tesi talk about the mysterious and thrilling responsibility of raising teenagers. As we've seen in the last six months, American teens are capable of organizing a worldwide march to end gun violence and yet also prone to staring at their screens for hours without any nourishment or personal contact. Teenagers are capable of tremendous amounts of love ... and slamming a door in your face. The women explore this topic with a few listener questions in mind: Why is parenting teenagers so isolating and lonely? What happens when you "love" your kid with all your heart, but you struggle to "like" them? As always, the sisters tackle these questions with great curiosity and do their best to reassure listeners with a down-to-earth exploration of the quest to know better and do better. Listen to Mama Bear Dares Podcast Episode 157: Female Friendship for a reminder of what we're capable of being for one another! Leslie's husband Jake is an alternative high school educator. His recent TEDx talk focuses on "kids these days" and how our expectations create our reality. Watch it HERE. We love Modcloth! Click here to check them out and use the special Mama Bear code! Click here to Leave some love for the mama bears and help grow this community! Download the Mama Bear Anthem from Songfinch here. It's FREE and beautiful! Alli Worthington is an entrepreneur and author who speaks about knowing yourself and trusting a fierce faith. Like many of us, she balances her family (five sons and a husband), her work, and her social obligations. Unlike many of us, she and her family faced a difficult health crisis that left her in a sea of fear, worry, and anxiety. When this onsalught of fear caught her off guard and threatened to overtake, she chose to fight back. Now, Alli wants to help others take steps to combat worry and anxiety. Leslie, Tesi, and Alli talk about what this looks like for women today in a candid conversation about expectations, anxiety, and how we view the world. Learn more about Alli HERE and buy her book HERE! Click here to leave some love for the mama bears and be entered to win! We're grateful to our sponsor, Molekule. Click here and use our promo code to receive $75 off your first order.